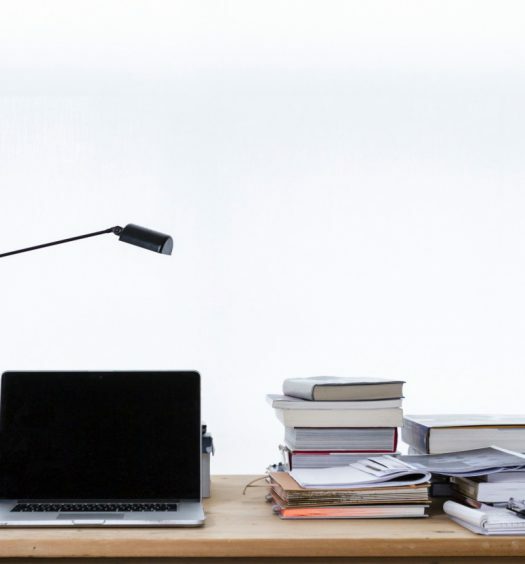 A fresh coat of paint is an inexpensive way to add some pizazz to your office. 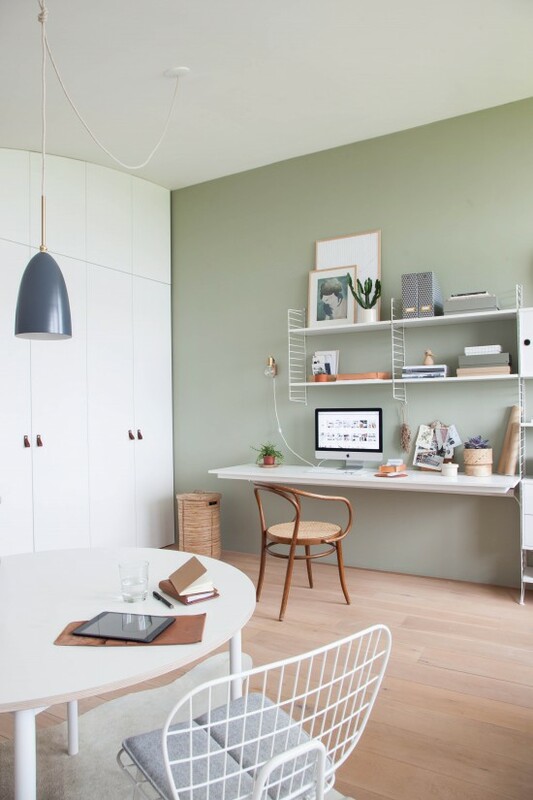 Here are some of our favorite home office paint color ideas. One of the easiest and most affordable ways to update your office is painting. 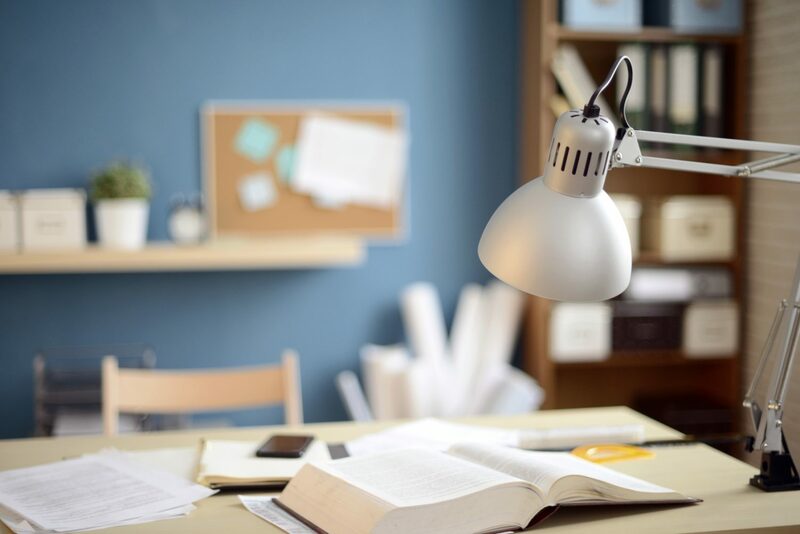 With so many home office paint color ideas out there, I wanted to highlight a few of my favorites and elaborate on how they can physiologically and stylistically improve your home office experience. This deep gray color is a game changer. I’m sure you have noticed over the last few year how popular grey has become for home décor and paint, and for good reason. It’s the new, modern natural and pairs well with nearly any color and most wood grains. Grays are known for their ability to evoke emotions of security, reliability, intelligence, and organization – all very good feelings for a home office. Another feature of this paint job, is that they also painted the baseboard which adds to the modern an clean feel. The color is Stone’s Throw 28-18 by Pratt & Lambert, but you can find similar rich grays at your local home improvement store. 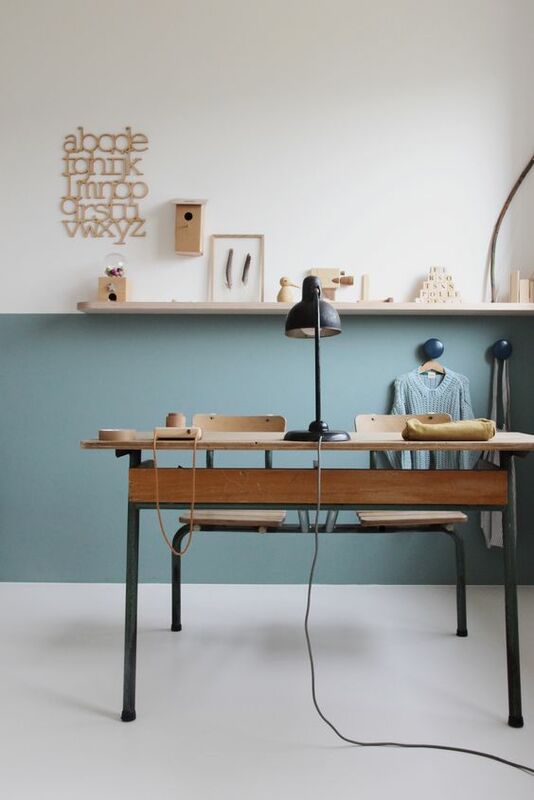 How soft and clean is this lovely light green wall? This soft seafoam green color creates a minimalist feel while providing some color but not overwhelming the room. It is the perfect color to get inspired and feel renewed, which is what greens are known to do. By only painting one wall and leaving the others and the adjacent cabinet’s white, they have opened up the possibilities of styling the room with a sophisticated neutral palette. We found Easy Green by Sherwin Williams to be a good match. Prestige Paints also sells this color, and is a great value. This workspace has me tickled pink. What chic girl, wouldn’t want to use this space for writing, studying, or just being effortlessly fabulous? What keeps it from looking like it belongs in a little girl’s bedroom is its dusty undertones – I feel like I am looking at an Arizona sunset on this wall. When decorating using this color it is ideal to stick to a neutral pallet – white, light wood, black. 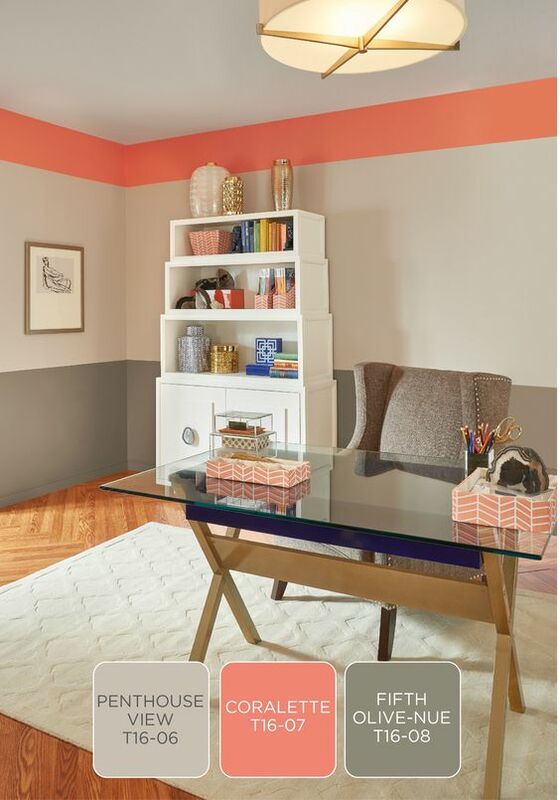 This beautiful color can be achieved with Benjamin Moore’s Georgia Pink. Kilz Tribute line has a color called Flapper Pink which achieves the same effect. This minimalist color and dichotomy of the two-tone wall creates so much visual interested without being busy. Two-tone walls have the ability to create height in the room and lineal lines can make the space look larger as well. The styling of this office focuses heavily on natural wood and industrial elements, but would also look good with metals if the rest of the palette is kept natural. Blues in this tone tend to give off vibes of calmness, quiet, and transcendence. 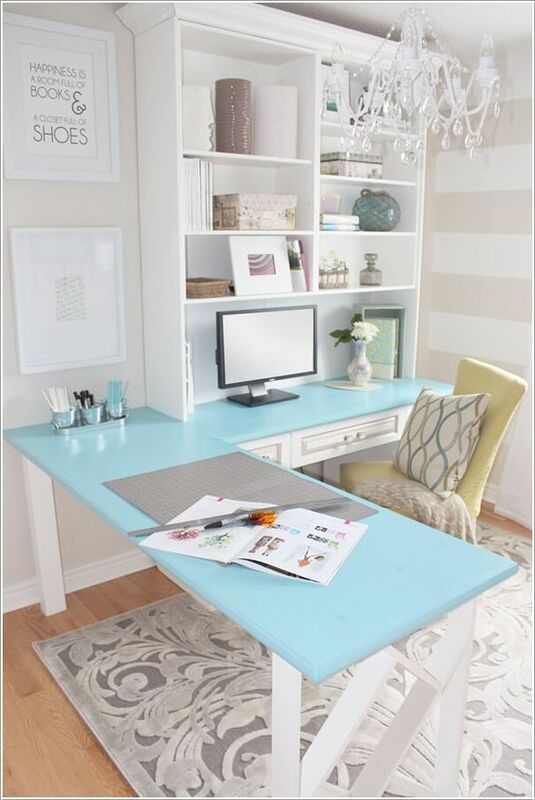 This beautiful home office paint color can be achieved by using Behr’s Tasmanian Sea. Greyge is a relatively new term to describe the lovely color trend of grey and beige. It has a delightful warmth but is much more modern that tradition beige. Another thing I am loving about this color is the ease of it. It literally goes with everything. It can be styled chic, romantic, modern, and minimalist. It’s the most beautiful neutral I have ever seen. 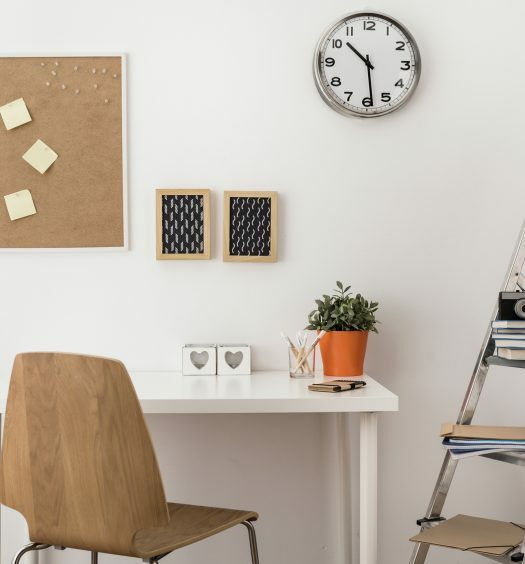 If you wanted to completely redecorate your office in a year, you could do so without changing the paint – it’s that versatile. The paint color is Stone by Benjamin Moore. I highly recommend using a matte finish to highlight the beauty of the color. I just had to feature this funky pop of color office that I find so fun and youthful. 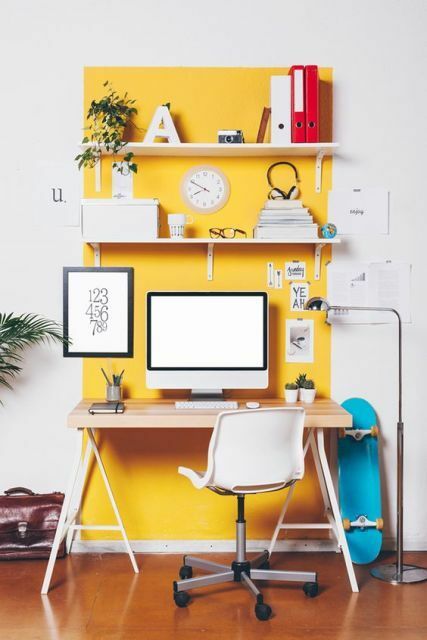 Using this stunning banana yellow to highlight the workspace is genius. It creates visual interest to an area that is otherwise ignored in the room. It looks amazing with neutrals but can also handle a few other pops of color like teal and bright red. The color yellow is known for being empowering, joyful and innovative. You’ll find Illuminate Me by Valspar to be a great match. A similar color is New York Botanical Gardens, Tropical Escape Collection, Interior Paint and Primer In One, 1-Gallon, Eggshell, Yellow Hibiscus. I suggest you get a good primer built in if you choose to go with yellow so you get the pop you are looking for. Using this color sparingly is the secret to keeping it refined yet youthful. This rich, glossy, deep teal is the stuff dreams are made of. This home office screams luxury to me. The rich color paired with the black whites and pops of orange keep is very current but somehow timeless. If you are going for modern elegance, this look cannot be beaten. This color is positive, serene and confident. If you’re looking to replicate, I found Gentleman’s Gray High Gloss by Benjamin Moore to be a nice match. If you are looking for traditional, understated elegance, this palette may be just the thing for you. Any girl would be lucky to call this her home office. The striped wall is pretty darn simple to do, but man does it make a big impact in a small room. This simple yet impactful style and color pair well with almost anything, but I think they look best with farmhouse modern and contemporary décor. If you want to up the work factor, use a paint with some sheen. Your office will be the envy of all your girlfriends. Our paint suggestion for this look is Kestrel White by Sherwin Williams. 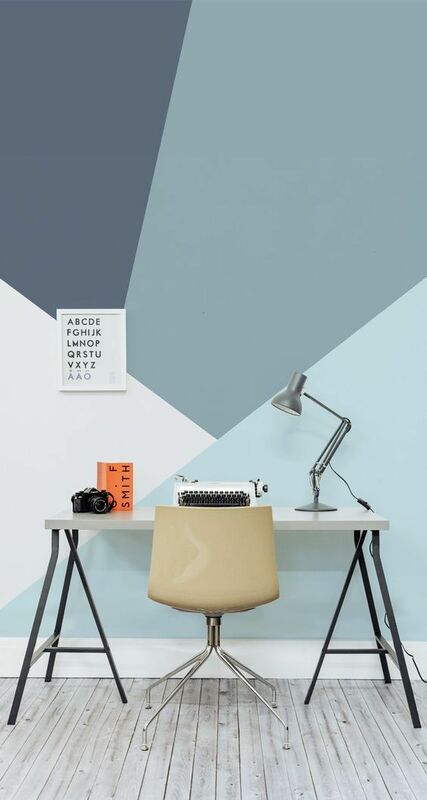 If you have an appreciation of the timeless beauty of the midcentury, you will love this updated bright blue on your office walls. Bright blue is known for its electric, vibrant, and exhilarating vibes. 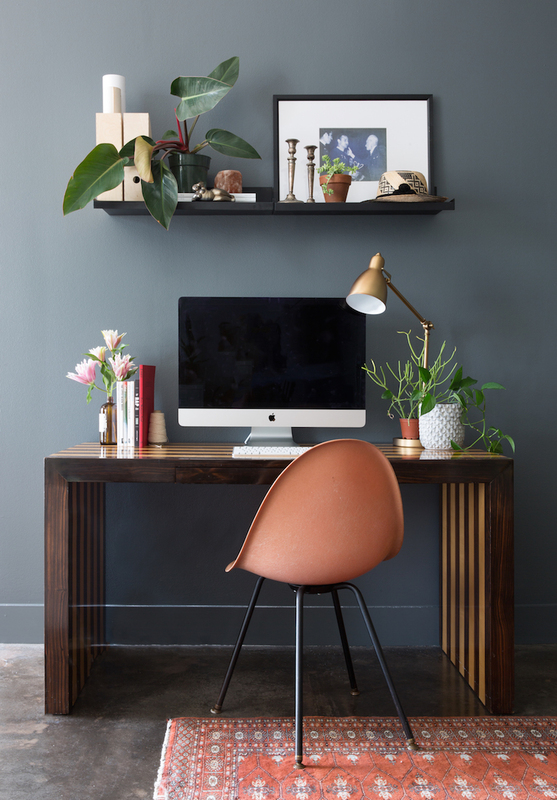 This home office paint color looks amazing with teak and walnut woods. It can be used with neutrals or other bright colors. Take a look at Benjamin Moore Twilight Blue or Glidden Interior Paint + Primer: Teal/Aqua Interior Paint /Blue Oasis, One Coat, Semi-Gloss, 1 Gallon for a similar effect. You know I had to throw one more grey paint color idea into the mix. This time, it’s much softer grey. I think of clouds during a fall thunderstorm. This pallet is best with neutral and monochromatic tones. White, lighter and darker grey, and black all lend to the simple beauty of this grey. This tone evokes a feeling of logic, modesty, and efficiency. 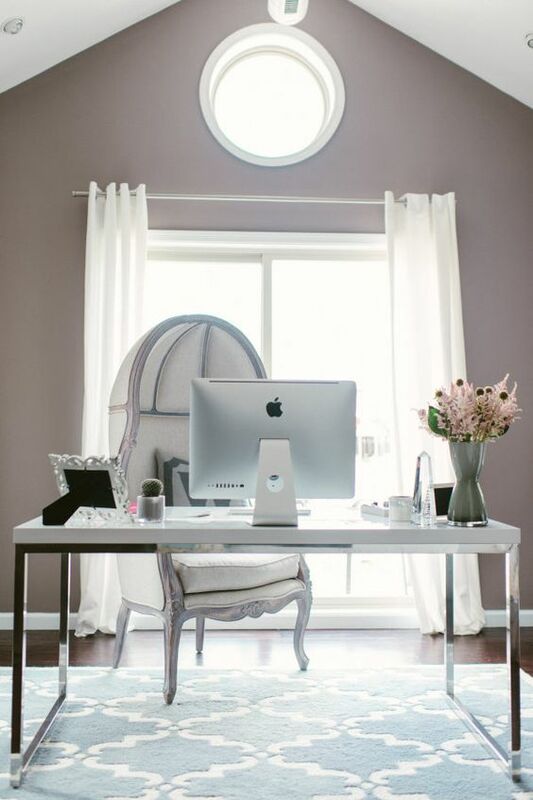 We like Iced Cube Silver by Benjamin Moore or Prestige Paints P300-T-MQ5-21 Interior Paint and Primer in One, 1-Gallon, Eggshell, Comparable Match of Behr Radiant Silver, 1 gallon B41-Radiant to create this beautiful home office. This beautiful use of horizontal borders at the top and bottom of this home office wall create a more expansive experience. 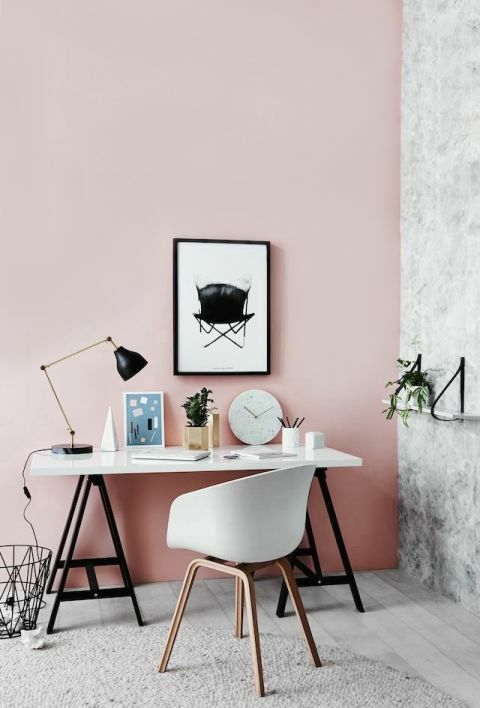 The contrasting color combination is perfect for the home office enthusiast who wants to step out of their comfort zone but not break with their traditional style. We love the combination of coral and taupe but could see this working with so many other color pairings – grey and chartreuse, cream and navy, copper and charcoal. The colors used here are by Behr. 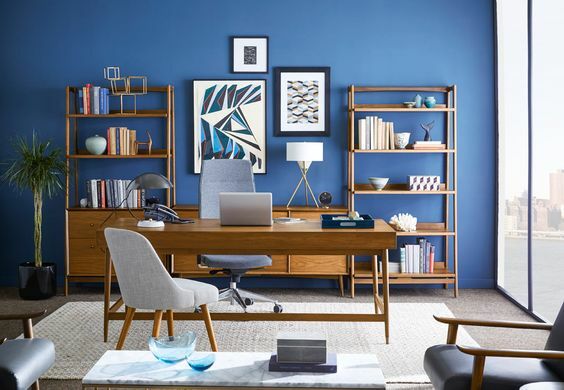 If you are looking for home office paint colors that pair well together, you will love the Monday Color Palette by Sherwin Williams. Choose any of the large squares for a primary color and any or all of the accent colors to tie it together. It’s like paint by numbers for your home office. One thing that you may want to play around with is the use of gloss and flat paints to create visual interest. These neutrals are calming, subdued, and can pair nicely with contemporary, rustic, or traditional furnishing. Looking to match a paint you may already have? Check out the Prestige Paint Color Match page on Amazon. 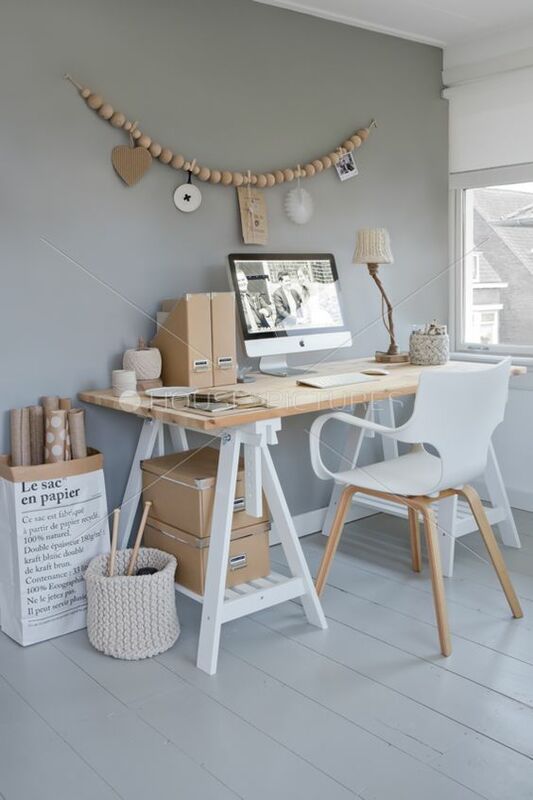 If you are thinking maybe paint isn’t for me but I need visual interest in my office, you may want to consider the look of wood planking, known as shiplap. 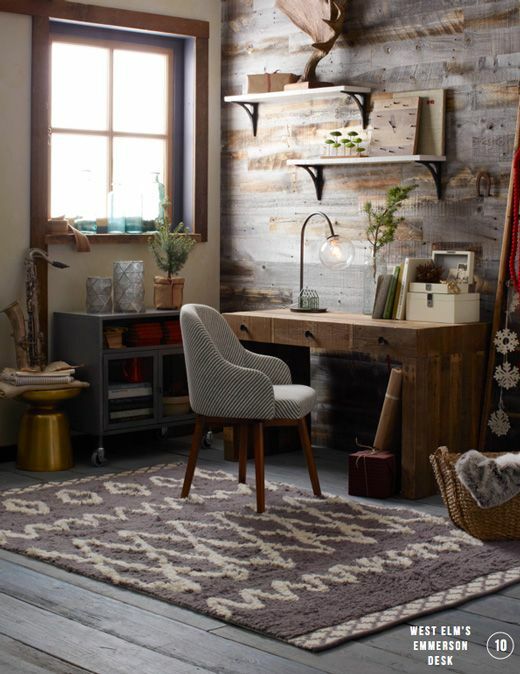 It’s easier than ever to achieve the rustic aesthetic, thanks to companies like Stikwood – who have created pull and stick planks that look like the real deal but can be installed in just a few hours. Available in a variety of colors and styles with samples that can be shipped right to your door, you’re sure to find one that will take your home office to the next level. How about creating a mural on your office wall? This can be achieved using a pre-made mural cut to the size of your wall or paint in coordinating colors. I was really inspired by this look. I love the monochromatic steel blues. It is simple and elegant. You can completely transform an office using this technique. 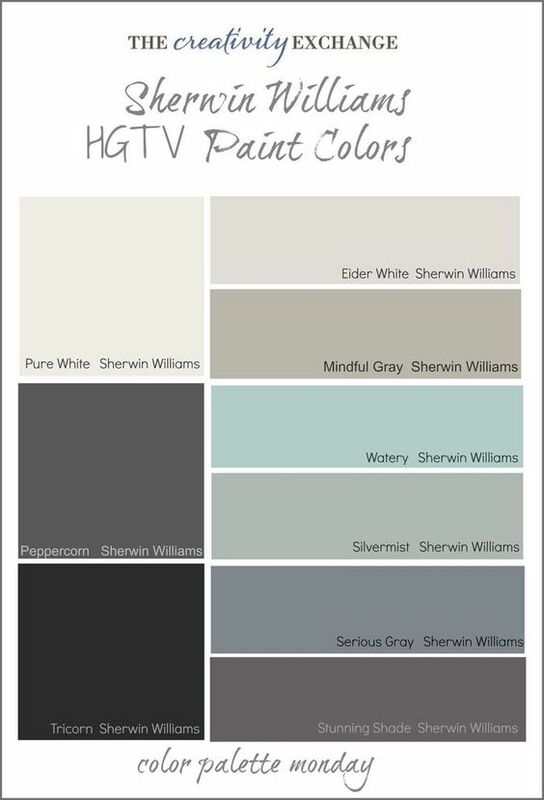 If you decide to do the mural in paint, consider using the Westelm paints by Sherwin Williams.